Our hips serve innumerable functions for our body; they keep us upright, allow us to bear weight, walk smoothly, run, jump, kick, and play. Since the hips are engaged in nearly every way we move, pain in this area can have debilitating consequences for patients. Although hip pain is frequently the result of osteoarthritis or injury, it can also be a sign of other health conditions. Hip pain is also seen in children/adolescents, although unusual and can be due to a number of causes, always best to consult your GP or chiropractor for advice and a diagnosis. Some conditions are unique to the growing skeleton. The age of the child or adolescent will be a good indication of the type of condition. However just like adults, the pain can be referred from other areas such as the lower back. A thorough history and physical examination will help to determine the cause of pain, with or without further imaging such as X-ray or MRI scans. Hip pain can originate from both the hip joint surfaces, and the structures and ligaments surrounding the joint. Within the joint itself, there is limited space for the femoral head to move in the socket of the acetabulum. If an injury or illness triggers inflammation, this space can become easily filled with fluid or blood (swelling), causing pain. Inflammation of the sac outside of the hip (bursa) can also be the source of pain; bursitis is often caused by minor trauma or overuse. 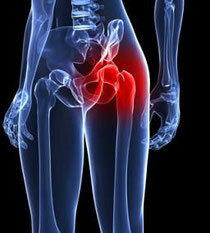 Among older adults, osteoarthritis is a common cause of hip pain. It involves a cycle of progressive cartilage loss and joint degeneration. Although this degenerative disease has no real “cure”, there are ways to slow its progression and prevent symptoms from worsening. Other genetic types of inflammatory arthritis can also cause hip pain like rheumatoid arthritis, inflammatory bowel disease, or inflammation of the spine (ankylosing spondylitis). Routine daily activities that place stress on the hip can also cause inflammation of the muscles, tendons, and ligaments surrounding the hip. This type of pain can develop gradually over time, and can develop into osteoarthritis. Fractures and dislocations of the hip or pelvis are easier to diagnose since they frequently result from direct trauma and can be detected with an X-ray. In elderly patients, a combination of aging, brittle bones, and poor balance, makes them susceptible to falls and hip fractures. Even if no bones actually break, the ligaments and muscles in the hip area can be strained, sprained, or bruised by direct trauma, and these injuries can still cause significant pain. A strain of a muscle or tendon and a sprain of a ligament or capsule, can be from the hip or the thigh. They can be caused when they are overstretched or over-contracted. X-rays are not usually required and should respond well to myofasical therapy and exercise advice. The hip is a stable joint and if laxity is present it can be difficult to demonstrate in a clinical setting. Most commonly there isn't usually one event that has caused this but can be a history of repetitive events. Hip pain in children usually requires further investigation and we would always recommend contacting your local GP or Chiropractor for further advice. It could be an issue with the way the hips are growing/forming, something they were born with (congenital), or commonly due to overuse in sports. 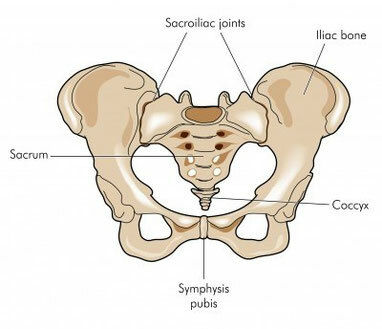 Often what patients describe as “hip pain” may actually derive from a different part of the body, and they may actually be suffering from dysfunction of the sacroiliac joints, or the lower back (thoraco-lumbar syndrome). Pain in the groin and hip can also be a result of a hernia, when the abdominal wall is torn or weakened. One of the more common types of referred pain is sciatica, or inflammation or irritation of the sciatic nerve. This can result from conditions like disc herniation, spinal degeneration, narrowing of the spine due to osteoarthritis, or Piriformis syndrome. Irritation of the nerve root can cause pain the in low-back, buttocks, hips, as well as radiating leg pain. Through careful examination and evaluation of your familial and personal history, your chiropractor can work to determine the source of your hip pain. They will then create a personalized treatment plan that can include a combination of chiropractic adjustments, exercise therapy, posture advice, stretching, massage, coordination with other health practitioners, and more. Treatments aim to reduce inflammation, relax any existing muscle spasms, strengthen weakened muscles, and improve the mobility of the joint. For home stretches for your hip feel free to visit our page for downloadable information sheets with examples. If you haven't already done so, please consult a chiropractor or physical therapist before attempting the stretches and exercises. If these exercises aggravate your pain please stop the exercises and contact the clinic for further advice. 1. McMorland G, Suter E, Casha S, du Plessis SJ, Hurlbert RJ. Manipulation or microdiskectomy for sciatica? A prospective randomized clinical study. Journal of Manipulative and Physiological Therapeutics. 2010; 33(8): 576-584. 2. Chapman C, Bakkum BW. Chiropractic management of a US Army veteran with low back pain and piriformis syndrome complicated by an anatomical anomaly of the piriformis muscle: a case study. Journal of Chiropractic Medicine 2012; 11(1): 24-9. 3. Kamali, Fahimeh and Esmaeil Shokri. The effect of two manipulative therapy techniques and their outcome in patients with sacroiliac joint syndrome. Journal of Bodywork and Movement Therapies. 2012; 16: 29-35. 4. Brantingham JW, Globe GA, Cassa TK, et al. A single-group pretest posttest design using full kinetic chain manipulative therapy with rehabilitation in the treatment of 18 patients with hip osteoarthritis. Journal of Manipulative and Physiological Therapy 2012; 33(6): 445-57. 5.Strunk, R and Hanses, M. Chiropractic care of a 70 year old female patient with hip osteoartritis. Journal of Chiropractic Medicine. 2011; 10(1): 54-59. 6.Poulsen E, Hartvigsen J, et al. Patient education with or without manual therapy compared to a control group in patients with osteoarthritis of the hip- A proof of principle three-arm parallel group randomized clinical trial. Osteoarthritis and Cartilage 2013; 21:145.